And now ... another tale well-calculated to keep you in - Suspense! 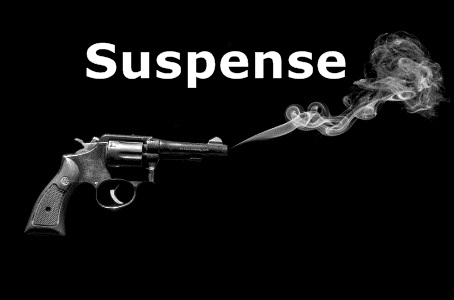 Suspense was a dramatic anthology series, and one of the very best OTR programmes, with many episodes still fresh and exciting to listen to today. It was produced by CBS and ran from 1942-1962. It drew upon the talents of many of the leading Hollywood stars of the day, such as Orson Welles, Cary Grant, Peter Lorre and Agnes Moorehead. As the name suggests, Suspense focused mainly on thrillers, but it also offered science-fiction, fantasy and horror tales. Indeed, one of the great strengths of the series was its range of subject matter: one week, the listener would be presented with a chilling ghost story, the next, a hardboiled detective tale. Episodes were adapted from the works of many of the greats of their respective genres, with stories by as diverse a range of writers as Edgar Allan Poe, Raymond Chandler, John Buchan and H. P. Lovecraft. There were 947 episodes in total (equalling approximately 754 individual stories, taking into account remakes - sometimes under different titles - and two-part episodes).